The project planning phase in providing simple sanitary disposal systems is important for determining which approach is most appropriate and suitable to the given community and environment. Note: The content on this page has been adapted from technical notes published by USAID, entitled “Water for the World”. Where there is limited water available for use in a sanitation system, the simple, low tech methods described in the “Introduction to Sanitation Facilities, Part 1” would be appropriate. These simple systems provide sanitary protection from disease associated with human excreta and they are economical to build and operate. If more water becomes available in the future, more complex methods of sanitation may be preferred, such as the use of cesspools and septic tanks. The project planning phase is probably the most neglected aspect of many community development projects, whether it is water resource development, providing adequate sanitation, or community hygiene education. Much time and energy should be invested in the project planning phase, in goal-setting, and in establishing step-by-step procedures for meeting those goals. There are eight major actions involved in the development of any project. 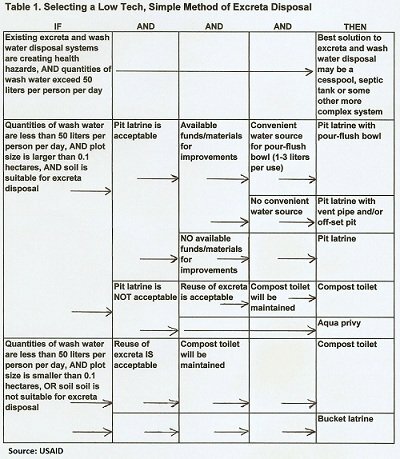 The project planning phase and implemention of a system for adequate sanitation involves the eight steps. Information concerning the need for sanitation facilities should part of the project planning phase and data should be collected from community members and community leaders as well as regional governments, if possible. Most useful and necessary to the project planning phase are observations of actual conditions in the field and personal interviews and conversations with the people who will most be affected by efforts to improve sanitation. It is important, in the project planning phase, to determine the present condition and methods of disposal of human excreta and wash water. Do the present practices present a health hazard to the community? Do people experience illness caused by poor sanitation (see Waterborne Diseases )? Generally, if the answer to all of the following questions is “Yes”, then a community should consider using simple, low tech methods of excreta and wash water disposal. •	Are wells, springs, or community standpipes the major source of community water? •	Does the community generate less than 50 liters of wash water per person per day? •	Are present methods of excreta and wash water disposal creating health hazards? •	Do children or adults suffer from illnesses related to water supply or sanitation? When the problem has been identified, in the project planning phase, as a result of unsanitary, improper, or inefficient disposal of excreta or wash water, then goals can be set to solve the problem. The main goal of sanitation development efforts is to establish an effective system for disposal of human excreta and wash water. Adequate disposal of these sources of disease-causing pathogens is a major step toward the improvement of community health. The goal of adequate sanitation cannot be met without strong community involvement from the project planning phase to the very end of the project. It is important to establish close working relationships with community leaders and organizers. Their ideas and suggestions should be sought out and valued. During the project planning phase, the project needs to be understood and accepted by the community members. In fact the community must perceive sanitation projects as “their” projects. A sense of ownership is essential to any community development project success. Secondary goals include a time span for establishing a sanitation system and decisions concerning who will be responsible for maintenance and upkeep of the system. As with all project decisions, community members should be involved in setting secondary goals. Goals must be realistic and within the capacity of the community resources, material, and skills. Goals must be measurable and specific, so people will easily know when they have been met. Examples of clear and measurable goals developed in the project planning phase may be to provide ten latrines within six months; or to provide effective waste disposal methods for half the families in the village within one year. At the end of the specified time period, it should be easy to determine if the goals have been met. Data collection should be an ongoing process and not just confined to the project planning phase. It may be carried out before, during, and after project implementation. Some data will be used immediately and some will be used later in the development process. Keep a written record of all data collected during and after the project planning phase. Some data will be quantitative, such as the number of persons living in a dwelling or the number of people using a water source. Other data will be qualitative, like the villagers attitudes toward new methods of waste disposal. The following checklists can help in organizing data collection. 1. Determine the incidence of disease associated with poor sanitation by personal observation, questioning community members and leaders and checking health records if available. 2. Observe and record evidence of excreta and wash water on the ground. 3. Determine whether excreta or wash water is being disposed of in or near sources of drinking water. Do this by personal observation and by inquiry. 4. Determine if there are bothersome numbers of mosquitoes or flies. 5. Determine if there are foul odors. 1. List the present methods of excreta and wash water disposal. 2. Determine the extent of the use of the present method (how many instances, locations, etc.). 3. Determine how many people use the present method (how many use each location, facility, etc.). 4. Determine if the present method can be improved by being upgraded or converted. 1. Ask questions of the community members and leaders, during the project planning phase, concerning their attitudes toward excreta and wash water disposal in general. 2. Ask questions of the community members and leaders about their preferences concerning specific excreta and wash water disposal methods. 3. Identify local customs and taboos concerning the disposal of human excreta and wash water and sanitation practices in general. 1. List the sources of money (private funds, local funds, government grants, NGO grants, taxes, etc.) and the amounts available. 2. List types and quantities of available tools and equipment. 3. List types and quantities of available materials. 4. List names and specific skills of available skilled workers. 5. List the names of available unskilled workers. 1. Record the type, (well, spring, stream, river) number, and location of all drinking water supplies. 2. Test and record soil conditions for suitability for excreta and wash water disposal. 3. Determine and record groundwater levels for the wettest season. 4. Record the number of community members and the physical size of the community. 5. Record the number of family lots and the size of each lot and the number of persons per lot. Use the collected data to formulate alternative systems for disposal of human excreta and wash water. Use the tables in "Introduction to Sanitation Facilities, Part 1" to help determine the best low tech, simple methods of waste disposal. The alternatives may be a combination of one or more methods of excreta disposal or one or more methods of wash water disposal. The alternative may just be a single method of disposal. When formulating alternatives, use only those that are practical for the community based upon the data you collected and those alternatives that are acceptable to the community. Reject any alternative that is obviously impractical, inappropriate, or unacceptable. Once inappropriate and impractical alternatives are rejected, what remains are those alternatives that may be real solutions to the problem. Next, you will select the best method. Need: Are present methods of waste disposal inadequate? Do people in the community suffer from diseases related to inadequate waste sanitation? Social Acceptability: This is the most important consideration. If the system is not acceptable, the people it was designed to help will not use it. Will the method of waste disposal violate any local customs, taboos, or preferences? Is the method likely to be maintained? Have the community members indicated that they prefer this method, or are they at least willing to try it? Resources: Is the desired method practical considering available money, materials, and workers? Is the regional government likely to provide monetary or other assistance? Geography: Are soil conditions and groundwater levels acceptable for the desired method? Plot Size: Is the plot where the sanitation facility is to be placed large enough for two alternating pit sites (at least 0.1 hectares)? Wash Water: Is the quantity of wash water generated more or less than 50 liters per person per day? Use Figures 1 and 2 in "Introduction to Sanitation Facilities, Part 1" and Table 1 on this page to help select the best method of excreta and wash water disposal. 1. Find the statement in the "IF" column that best describes your situation. 2. Move to the adjacent boxes in the first "AND" column and select the statement that best fits your situation. 3. From your statement in the first "AND" column, move to the adjacent boxes in the second "AND" column and select the statement that bestfits your situation. 4. From your statement in the second "AND" column, move to the adjacent boxes in the third "AND" column and select the statement that bestfits your situation. 5. From your statement in the third "AND" column, move to the adjacent boxes in the "THEN" column to find the recommended method of excreta disposal. These tables are not meant to be followed strictly. They are merely aids to selecting the best sanitation method. Community involvement, as we keep mentioning, is a top priority in any community development project. Establishing the new system of excreta and wash water disposal requires that the community be involved and that the plans for the chosen alternatives be presented to the community for approval. Planning for construction also will involve the community as at least some of the work will be done by community members with community resources. Gaining public acceptance is key to the success of any sanitation improvement and needs to be addressed during the project planning phase. It may be a good idea, if possible, to arrange for community leaders to visit another community where similar projects have been completed and proven successful. They will bring information and “inspiration” back to the rest of the community and stimulate interest in the project. It may be worthwhile to build one sanitation facility as a demonstration of both the construction processes involved and the end result of the planned project. It will allow people to see things first hand and to understand and use the facility for themselves. A demonstration model may act as a final test of community acceptance before going into full scale construction. Next you will submit your plans, if required, to the regional or national government or to a lending agency or possibly to an NGO that is helping improve community sanitation. Since they will want to see the whole plan before you proceed, you want to be sure to include the proposed technical system, the costs involved, your sources of financing, and an implementation schedule. In submitting the proposed technical system, you will want to include designs, drawings, or photographs of the sanitation method selected. Decide how many units will be built and where they will be located. Include maps that show these locations. Include dwellings, water sources, and present and proposed sanitation facility locations on the map. Bring community leaders and others to speak for the community when you present the plans for the project. In submitting the costs involved in the project, determine how much money will be paid to construction workers and the expected construction time. Determine how much money will be required for tools, equipment, and materials. Make every effort to locate these items locally. Estimate future cost of maintenance and repair for a specific period, say one year, for example. In submitting your sources of funding, you may be using local sources or national and international sources. Local funds can come from the community water committee or through local government in the form of taxes or grants. User fees may be charged per family using the facilities or the community may already have a health fund in place for development of such improvements. Determine the community members’ ability to contribute some or all of the labor and materials for pit linings, shelters, etc. Outside sources may be willing to donate concrete, wood, or other materials and, in some cases, even contribute labor, advice, help, or guidance. In submitting an implementation schedule, assign reasonable and specific time spans for each phase of the project. To help visualize the entire project, draw a chart or devise a visual representation that shows specific tasks and time required to complete them. Planning for construction is the third step in establishing the system. Determine which components of the sanitation facilities can be constructed in the community and which components will have to be purchased from outside. Decide who will do the work, the type and amount of training they will need, and how much they will be paid. Determine tools, equipment, and materials needed and be prepared to gather them together. Organize construction, assign duties, set up time schedules, and designate someone to oversee the work. It is very important for the sustainability of adequate sanitation that, during the project planning phase, you be sure to plan for the continued use of the facilities once they are built. This includes routine cleaning of latrine slabs and inspection of the shelters and periodic removal of sludge or compost. Establish a system of cleaning, maintenance, and repair. Workers must be trained and materials made available. If systems are not routinely maintained, they will become unsanitary and may pose a health risk that they were intended to alleviate. Plan ahead, during the project planning phase, to establish a timetable for returning to the project site and making periodic evaluations of usage and performance. Evaluate the project 6 months, one year, and five years after completion to assure that project goals are being met. Determine the success of the project by questioning community members on their use (or lack of use) of the facilities. Compare health aspects of the community before and after implementation of the project. Compare the conditions of the facilities with the conditions existing before the project. Determine if old problems have been eliminated and decide if any new problems have developed. This is the time to make changes if things are not going as planned. Be flexible and ready to update facilities if usage over time reveals that changes could be beneficial. Sanitation improvements in rural areas are usually accomplished one step at a time. Use your evaluation process as a spring board to other improvements that might be beneficial. Use this time as a first step in planning the next sanitation improvement. Return to "Introduction to Sanitation Facilities" from "Project Planning Phase"